-As is the case at all of the global health conferences that I have attended recently, there is growing momentum to not only strengthen health systems, but approach the subject rigorously (though that will be quite difficult). 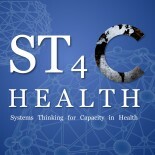 -The Alliance for Health Policy and Systems Research launched a hundred-some page document outlining a ten-step process of health systems strengthening, “Systems thinking for health systems strengthening”. I think that the report is timely and important. There is still a need, in my mind, for a more focused set of principles targeted toward externally-funded global health planners and policy makers. That will be the role of our consensus statement. -The First Global Symposium on Health Systems Research will be held on November 16-19 in Montreux, Switzerland. This entry was posted on November 23, 2009 by chads in HSS Consensus Statement, Resources for HSS Consensus Statement.